I wake up with a huge white dome posing outside French windows of my hotel, the only one that has a view of the Taj Mahal in Agra. It’s like a white marble planet. Every side is equal, now some more than others as scaffolds have been rigged to facilitate restoration in process. On one side is a mosque on the other is its twin, bu t a guest house. Many Indians visit it during the off-tourist season. From a distance women wrapped in sarees look like jelly bellies poured down the white marble trails. Many are barefooted. Europeans/Americans are allowed to wear shoe covers, which knocks out the holy place concept and keeps the floors from being scratched. This is the Taj Mahal, the seventh wonder of the world. I don’t know what counts to make it such a treat, other than the dramatic legends of love associated with it, and the fact twenty thousand artisans and cheap labor spent 22 years building it mid 17th century. One Emperor footed the bill. There are expensive books of nothing but the Taj Mahal in photographs but it’s not that the details are particularly earth-shaking. It’s how the sun or moon reflects on it. At night, the city of Agra does not light it up. I suppose it’s the legend more than its architectural presence that gilds its personality. A tomb is a to mb, after all, and this is a Muslim one, which means decor is abstract and patterned. It looks as if it would rise up at any minute like a shuttle from Kennedy Space Center. You wonder if it would fly. Kites do, not to far away. And the usual bevy of pigeons pester exotic gardens in the humid sun. Water pools reflect the domes and Indian families huddle together for photographs. I was invited a number of times to be in family photos. I have no idea why other th an I wore my white Raj scarf with holy words on it that I don’t know how to translate. I have not seen a duplicate except in the textile museum of the maharajas under the category of block printed - and am embarrassed to say I brought it from America. 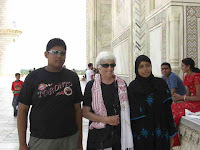 The new friends were usually y oung Muslim women covered in black robes. It was really steamy hot, but the atmosphere was light and I made note that Muslim women and a Christian woman were shoulder to shoulder. 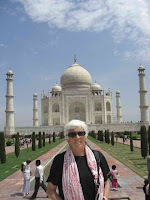 Mausoleums abound in India, some in white marble, others in pink stone or brick, others in yellow, but the Taj Mahal is the queen of them all. Women world wide wish they were loved by someone who’d spend his fortune on this kind of tribute of affection, rather than grieving at a golf course or some bar or in some medic’s palm. The story of Emperor Shah Jahan, grandson of Akar, the first champion of India, and CEO of India in the 17th century, and his love for his wife Mumtaz Mahal, a descendent of Kubla Khan and Genghis Khan, is a tear-jerker. 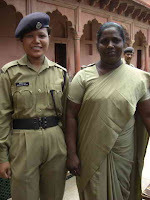 Jahan, who also b uilt the Red Fort and the Jama Masjid in Delhi, squired and married her and by the time she had hit 36 years of age, she had given him 14 children. She died in childbirth but not before receiving the promise he would do three things: not marry again, build the most beautiful tomb in the world, and take care of the children. Many of the offspring died, as was natural in 17th century conditions, but the youngest son Aurangzeb, a greedy ambitionist, led a rebellion and gained power by killing off his brothers, and putting his father in prison for eight years. 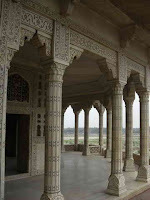 M ind you, the place prison was inlaid marble with major balconies overlooking the city of Agra and the famous Taj Mahal. The son, a fundamentalist Muslim, destroyed the Mongul empire and turned India into chaos, destroying the temples of the Hindus, until the 18th century when the British colonialists took control. 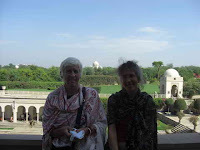 We had risen in time to catch the 6 o clock train from New Delhi to Agra - a two hour experience on India’s railways, where breakfast was served in the exact style of an airplane meal. Rats and sleeping bodies congest the station at dawn and human waste was all over the tracks. Crowds with tall porters carrying large bags of white people on their heads (everyone else carried his own) mixed with flies, pigeons, cell phones and products to become breakfast once loaded. In the first class car, seats had pink arms and tray tables. 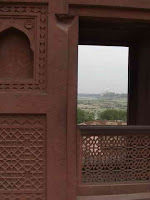 Agra was another crowded city with elegant hotels behind large walls. But it was as touristy as Jaipur with the usual barrage of beggars, pickpockets, police armed with wooden sticks, and aggressive barkers trying to get you your veins. Water buffalo, humped brahma bulls, goats and javelina wander the littered streets planted with bougainvilla between street vendors with their artfully arranged trays of bananas, mangos, coconut slices, custard apples and fresh melons. Men on the street looked terribly junky, poorly dressed, with the only fashionable ones being doormen and waiters in sikh attire. After the walk through Taj Mahal, our guide insisted we exp erience how artisans inlaided the Taj Mahal’s precious stones (turquoise, lapis lazuli, cornelian, etc.) and of course I’ve gotten used to that by now. You go see beautiful prod ucts that you cannot resist. 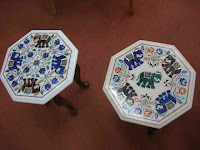 Once the salesmen so skilled in smooth talk have hooked you, and you purchase small tables inlaid with elephants and rabbits, they say, "now let me show you a special room." They do this as a carpet scam too. Everyone is selling carpets, for some reason. And pashminas. Bite the hook, and they drag you along at their speed. I just say, I have no carpets, I want no jewelry or souvenirs. Of course, they don’t believe you and keep hassle you just to the point you are out the door. I hate this part of shopping in India, or Tibet, or Jerusalem or almost anywhere outside the US. 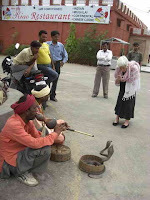 B ut the creme de la creme for me this day was a visit to a dusty square to see a snake charmer. Yep, the old cobra trick. I couldn’t leave India without adding that to the bucket list. 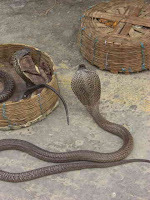 Although it was out of tourist season, my guide was able to arrange for two charmers to charm me with their bulbous flute and magic vibrations that kept cobras under control. These two cobras look ed like they’d been in vaudeville for years, one was five, the other six, and they were not eager to rise from their baskets, puff out their necks, and sway to the rhythm of that piercing sound. But they were coddled and woken up and they did what they were supposed to do, delighting me. 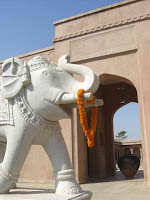 Photos: Elephant welcome at Agra hotel; Sue and I with first view of Taj Mahal; Centering at the Taj Mahal; posing with Muslim youth; Two police security officers; Red Fort with view of Taj Mahal; prison of Shah Janan; artisans setting precious stones; inlaid tables; the charmers enticing two cobras; two cobras who had rather roll up in the basket and sleep.